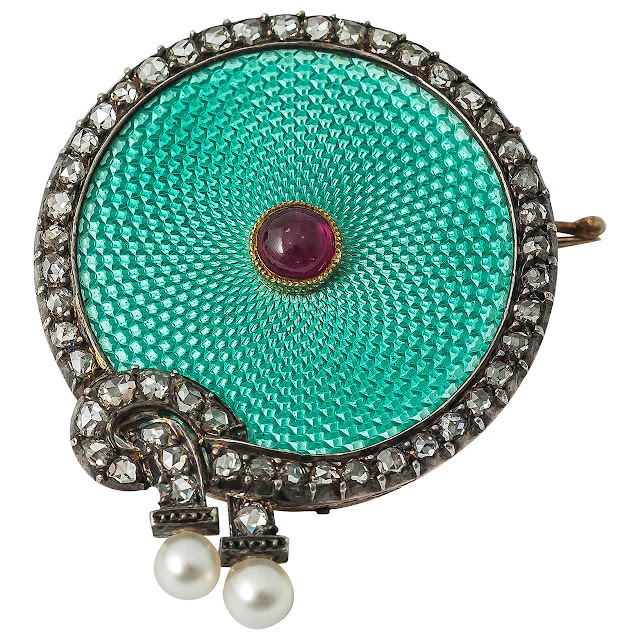 Today I want to show you another one of Fabergé's brooches! This one was made by workmaster August Hollming, sometime between 1895-1904. The circular brooch is covered in turquoise enamel over a guilloché ground. It's framed by a band of rose-cut diamonds "tied" in a knot, ending with two pearls. In the center sits a cabochon ruby. The diameter of the piece is 2.9 cm, and for 19,764 USD it can be yours! It's currently for sale at 1stdibs. You find it here!